Jon Wertheim's 40 takeaways from the BNP Paribas Open in Indian Wells, including notes on Raymond Moore's comments, Djokovic, Azarenka, Serena, Nadal and more. Get all of Jon Wertheim's columns as soon as they’re published. 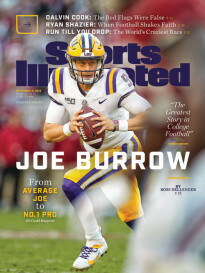 Download the new Sports Illustrated app (iOS or Android) and personalize your experience by following your favorite teams and SI writers. It’s not quite a major, the BNP Paribas Open. But it’s damn close. So we came up with 40—as opposed to our customary 50—notes after a week in Indian Wells…. • Whatever rankings Victoria Azarenka holds, it’s essentially decorative. She is a top four player in the women’s game right now. And she proved it emphatically at Indian Wells, playing crisp tennis for 11 days and then beating Serena Williams in the final. She comes to play armed with near-unshakable self-belief. Which is half the battle these days. • Novak Djokovic won his record fifth Indian Wells title. And the scary thing: for most of the tournament, he wasn’t at his best. • Sounds strange to say this about the No. 1 player, but Serena Williams is (over)due for a title. 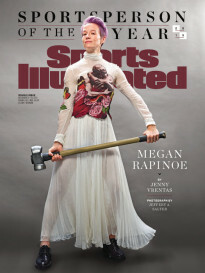 Her U.S. Open loss was excruciating, but understandable. She played well in Australia for six rounds but ran into a hot, opportunistic player—(the since-vanished Angie Kerber)—in the finals. In Indian Wells, Serena couldn’t close against Azarenka. Suddenly, she goes to Miami seven months removed from her last title. • Milos Raonic played terrific tennis to get to the Australian Open semis, before his campaign was thwarted by injury. Milos Raonic played terrific tennis to get to the Indian Wells final, before his campaign was thwarted by injury. • Can we all agree: tennis is better off when Rafael Nadal is on his game? While Nadal lost to Djokovic in a well-played semifinal, this was a marked improvement in his play and his attitude. • We can talk about the equity of equal prize money and whether the moral grounds should supersede economic grounds. (We say yes.) But Ray Moore’s remarks are beyond indefensible. Bear in mind, too: it wasn’t like he was ambushed by a journalist and spoke hastily; he was speaking at an annual “state-of-the-tournament” press conference to which he surely came armed with a some semblance of a plan. After 15 years, the tournament finally gets over its regrettable history with the Williams sisters and now this? We say it again: Tennis, the sport that can't get out of its own way. • Full disclosure: I wrote this before Sunday’s kerfuffle. It sounds a bit tone deaf after Moore’s comments, but the sentiment holds. Sure, it helps to have a billionaire benefactor. And, yes, Indian Wells’ profit margins no doubt look different from those of most other sporting events. But, still, this tournament has become a gem of the circuit for reasons that have nothing to do with economics. Other sports properties—inside and outside tennis—would do well to observe this tournament and note how a series of small touches add up. • Spare a thought for Steve Simon. The poor guy is only a few months into his job as WTA Tour CEO. So far, he gets a match-fixing scandal. And one of his stars failing a drug test. He gets stuck with a most unfortunate television deal that his predecessor negotiated, the fallout from which is starting already. (This is a story to follow: Odd that the leading women’s sport would make a deal with a network based in Qatar, given the track record on misogyny and homophobia.) And now, his former colleague at Indian Wells has ignited a cause célèbre by denigrating women’s tennis. Whatever happened to a 100-day grace period? • If you thought your March Madness bracket was in shambles, try filling out a doubles draw before a pro tennis tournament. As it was, Bethanie Mattek-Sands and CoCo Vandeweghe beat Karolina Pliskova and Julia Goerges to take the women’s title, while Pierre-Hugues Hebert and Nicolas Mahut beat Jack Sock and Vasek Pospisil in the men’s. • There’s much hand-wringing in tennis about what the sport will look like in the absence of Federer and Serena, the 34-year-old centers of gravity. Well, on the first Saturday, neither Federer nor Serena (nor Djokovic nor Sharapova) played. And yet the session was sensational. Old, young. Upstarts, vets. Doubles, singles. There will be an adjustment period, no doubt. But the sport will prevail. • While she lost to Victoria Azarenka in the semis, it was nice to see Karolina Pliskova make a deep run here. She is way too good a player—armed with way too potent a serve—to be ranked outside the top 10. And she is too good never to have been past the middle weekend of a major. • Unquestionably, the breakout star of the event was Alexander Zverev, the 18-year-old German who’s been divined by many as a future Slam winner. Let’s just hope that he recalls this event for his defeat of Ivan Dodig, Grigor Dimitrov and Gilles Simon. And not for his squandering of a match point against Nadal. That said, this was an impressive self- assessment. • From the every-match-tells-a-story department….In their fourth round match, David Goffin and Stan Wawrinka had broken each other 13 times through three sets. In both the second and third sets, Goffin failed to serve out the match. By the time we were at 5-5 in the third-set tiebreak, each player had won 107 total points. Wawrinka then shanked an overhead that recreational player Erin McPartland would make six times out of ten. (Happens to all of us, even two-time major winners.) Goffin wins the subsequent point and with it, the match. • Before the tournament, the WTA distributed talking points to the players—achingly bland, on-message sound-bites designed to douse any controversy. At some level this makes sense: there are business justifications for minimizing tension and tendentiousness. At the same time—not unlike on-court coaching—the optics here aren't great. “Strong is Beautiful,” goes the catchphrase. Part of strength is having your own opinion. Which is why Kristina Mladenovic deserves credit. Agree or disagree with the substance of her remarks, she’s to be applauded for a willingness to go off-script. • Sharapova and the ethics of competition in general were topics discussed on this week’s SI Tennis Beyond the Baseline Podcast. Tennis Channel’s play-by-play man and deputy coroner, Brett Haber, was the guest. • The woes for the Bryan brothers continue. After holding seven consecutive match points and leading 9-2 in a supertiebreak—there’s a score you seldom see—they fell to Edouard Roger-Vasselin and their longtime foil, Nenad Zimonjic. • Irony: before that, one of the more entertaining matches: the doubles contest pitting the Bryans, Bob and Mike, against Rafael Nadal and Fernando Verdasco. There were all sorts of themes here, not least the pitting of the top doubles team of the past 20 years against two singles stars. At 8-8 in the supertiebreak, it was Nadal (more irony) who double-faulted and shanked a forehand. • Correlation doesn’t equal causation. But savvy fans noted that Roger Federer’s departure from IMG in 2012 coincided with his skipping the IMG-owned Miami event several times in subsequent years. Happily, that didn’t prevent him from entering in 2016, his first tournament back since the knee injury. Happy emojis all-around. • Heard from multiple people that Steve Simon’s priorities as the WTA’s CEO include trying to reduce dramatically the number of tournaments on the circuit. A good idea in theory. Let’s see if he can pull it off. • How do we feel about Djokovic sitting next to tournament owner/overlord Larry Ellison during the Gael Monfils–Milos Raonic match? • Biggest upset of the tournament? Bjorn Fratangelo taking a set off of Djokovic was an early contender. Strictly by virtue of the score, Nicole Gibbs beating Madison Keys 6–3, 6–3 is a candidate. But how about Sania Mirza and Martina Hingis falling to Alla Kudryavtseva and Vania King? • One of the stranger matches: Jack Sock and Dominic Thiem—two stars in ascent—split the first two sets of their third-round match. Early in the third set Sock becomes upset and complains that his former CAA agent was heckling him from courtside. Sock completely checks out of the match, losing the third set 6–1. • Trivia: who are the WTA and ATP’s leaders in wins so far this season? • Nice event for Frances Tiafoe, who beat Taylor Fritz in an alpha dog match and then had a match point against David Goffin before retreating. (A loss that looked increasingly impressive with each subsequent match Goffin won.) As Jim Courier nicely put it, “Now the hard work begins.” Tiafoe showed that he can win on a high level and challenge a top 20 player. Now he needs to get to work and build on it. • Talk to football writers and, to a man (and lamentably the overwhelming majority are men) they’ll list Larry Fitzgerald as one of their favorite players to cover. (Which puts them at odds with most NFL defensive backs.) Yet again, Fitzgerald made an appearance at Indian Wells as a fan. No special appearance. No requests for the Royal Box. Just walking the grounds like everyone else who bought a ticket. • John Isner has lost five matches this year; he’s held match point in three of them. At this event, he fell to Kei Nishikori 7–6 in the third. • As you may have inferred over the years, we despise the WTA’s failed experiment with on-court coaching. Most important, this corrupts and compromises a central tennis principle: self-sufficiency. The visuals are terrible, these damsels in distress being counseled by men. The losing player is the one who inevitably asks for the coach, so the interludes skew negative. The television proposition is either worthless (“Keep fighting hard”) or embarrassing to the player. We got an example of the latter when Garbine Muguruza was seen tearfully telling her coach, Sam Sumyk, that she didn’t want to be on the court. Not only is this distressing, a recent Grand Slam finalist and top five player projecting this level of fragility and self-doubt; if I’m another player in the locker room, I’m remembering this. • Likewise, lots of questions swirling around Madison Keys. Fortunately, she showed no ill effects of the abductor injury that caused her distress at the Australian Open. But—at the second biggest American tournament—what a mystifying performance for Keys, losing 6–3, 6–3 to Nicole Gibbs. • Glass half-full: In November, Gibbs issued a Facebook post that drew all sorts of attention. Since then? She has won 17 matches. Her run here included a defeat over Keys followed by a solid win over Yaroslava Shvedova. • If you missed it, here’s the Tennis Channel/SI collaboration on the tennis-playing daughters of South African rugby titan, Ruben Kruger. • The death of the one-handed backhand has been greatly exaggerated. Stan Wawrinka, Richard Gasquet and Dominic Thiem are among those holding down the proverbial fort. You know what is a dying art, I’m afraid? The topspin lob. • Congrats to the great Mary Carillo, winner of the 2016 Annalee Thurston Award. • How would you answer this? "Hello Jon, I am a big fan of tennis. Have been for over 25 years. I enjoy both the men's and women's tour. It ranks No. 3 on my list of favorite sports to follow. With that being said, between the doping, gambling, cover-ups, racism and sexism on display over the last couple of years, I am losing my patience with this sport. Why should I stick around for this when it seems the powers that run this sport are so intent on destroying this sport?" • Trivia answer: Dom Thiem and Genie Bouchard. 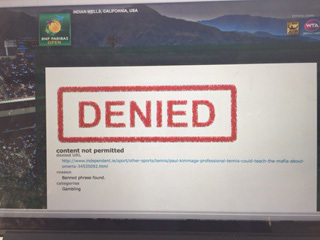 • Long as we’re dispensing kisses to Indian Wells….every tournament needs to take a cue from Indian Wells and install Hawk-eye on all courts. The alternative flies in the face of fundamental fairness. • After the Australian Open, Petra Kvitova parted ways with her longtime coach, David Kotyza. Slow to name a replacement, Kvitova—one of the most consistently pleasant and maddeningly inconsistent figures in the sport—told us that she is rather enjoying the freedom and autonomy. Still, she was hitting here with Frantisek Cermak, a former ATP doubles player. • Likewise, nice to see Dasha Gavrilova working with the impassioned Rennae Stubbs at this event. • And here it is, your moment of Zen.